Mitcham is a popular district of south London in the London Borough of Merton. It’s centred just over seven miles (11.5 km) south-west of Charing Cross. Regarded as a suburb, it’s on the border be-tween Inner London and Outer London, and was historically in the county of Surrey. Often sub divided into Mitcham Town Centre and Mitcham Common it’s well developed both residentially and commercially, with good connections via train, bus and tram. Locals know there are culinary gems to be found here when you know where to look. Like CHAK89, an award-winning restaurant with a reputation for serving impeccable cuisine of the highest quality. It’s famed as a banqueting venue as well as a restaurant, playing host to a stellar selection of celebrities, sportspeople and pop stars. It’s also a popular night spot for the cream of Bollywood whenever they’re in town. 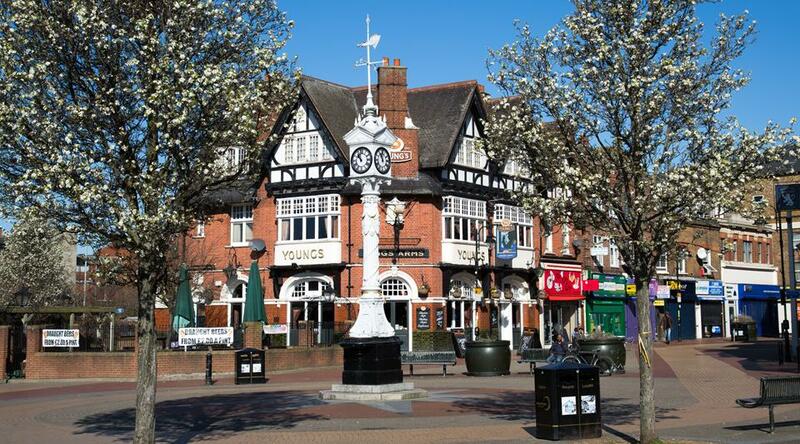 The Kings Arms is an old traditional pub, almost certainly Victorian and right by the open area centered on the Mitcham Clock Tower. The White Hart pub is a listed 18th century building close to the Cricket Green and the Wandle Industrial Museum and has some spectacular hanging baskets displayed outside every summer. Mitcham appears in the Domesday Book as Michelham. But its current name derives from Anglo-Saxon times and is believed to mean ‘big settlement’. At the heart of local history lies the Cricket Green. Not just the home of Mitcham's much sought after conservation area, as the name suggests it’s also the location of what is believed to be the world's oldest Cricket Green — in continual use since 1685. A century earlier Queen Elizabeth I made regular visits to the area. Thanks to the surrounding abundance of lavender fields the area was renowned for its soothing air, which later led people to settle here during the time of the plague. Lavender oil was distilled commercially, and local physic gardeners John Potter and William Moore founded a company to make and market toiletries from the locally-grown herb. Lavender still features in Merton Council's coat of arms, and on the badge of Tooting & Mitcham United F.C. Mitcham was an important industrial centre from the end of the 18th century until the 1960s. At one time the 11-mile length of the River Wandle boasted 90 mills, producing everything from snuff and corn to dyes, gunpowder and the printed calico for which the area became world famous. Nowadays it boasts 460 acres of green space, including woodlands, parkland and the pathways which set Mitcham Common apart from its busy surroundings. Adding to the outdoor attractions is the Mill House Ecology Centre, where you can see local conservation work in action. The annual Mitcham Carnival takes place in June on Commonside West. It’s a must for local families, with a programme of entertainment on the main stage, sporting events for kids including football, netball and BMX, and 120+ stalls. Mitcham Common itself is also a regular venue for funfairs and firework displays, making it a focus for the community throughout the year. A secret locals don’t want to let out is the Oriental Supermarket & Wholesaler Hoo Hing on Western Road selling everything needed to prepare the perfect Asian. The small café at the rear serving, value no fuss chinese food is particularly popular at weekend lunchtimes. The increasingly popular supermarket chain Lidl has a branch also on Western Road. Mitcham Market is getting a new lease of life with special themed days and ‘Love Mitcham’ events boosting local traders and encouraging entrepreneurs to set up in Mitcham. Transport facilities have improved immeasurably in recent years, with the introduction of the 4-stop tram in 2000 giving easy access to Wimbledon, Croydon and Beckenham. More recently, the introduction of Mitcham Eastfields Railway offers a direct line into central London, as well as connections to the south coast.